Preheat oven to 400 degrees. In a large bowl, toss together butternut squash, 2 tablespoons olive oil, sage, thyme, salt and pepper. Place carrots, remaining tablespoon olive oil, salt and pepper in the bowl; toss together, then spread in a single layer on another baking sheet. Place both baking sheets in the oven. Roast carrots about 20 minutes, until tender; roast butternut squash 20-25 minutes until tender. Place figs, cranberries and apple cider in a saucepan; bring to a boil, then reduce heat to low and simmer, covered, for 15 minutes; turn off heat and let sit until you are ready to assemble the salad. When ready to use, remove figs from reduced apple cider and cut off stems; cut figs into quarters. Reserve reduced apple cider and cranberries. 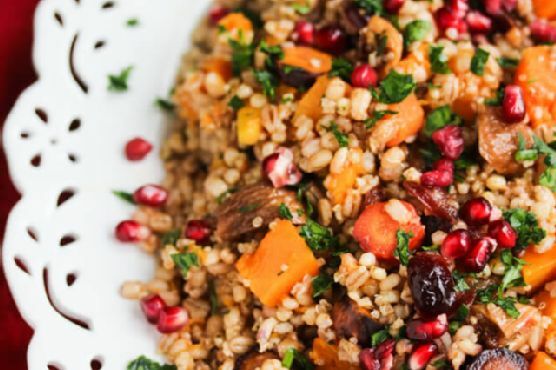 Place cooked grains in a large serving bowl and toss with olive oil, vinegar, parsley, thyme, pomegranate seeds, clementine juice, roasted butternut squash and carrots, figs, reduced apple cider and cranberries. Season to taste with salt and pepper.